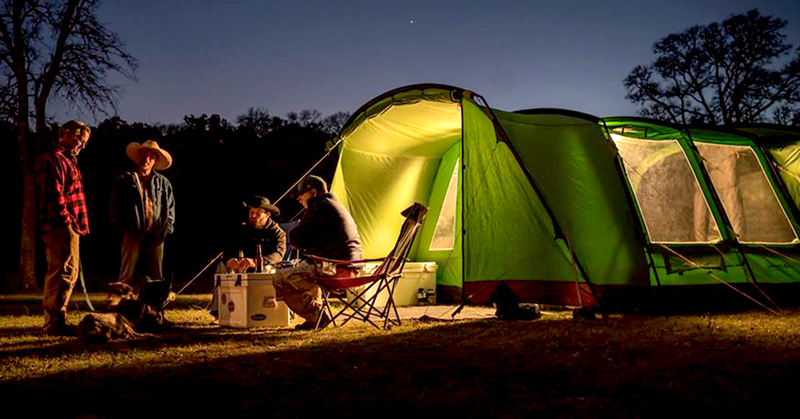 You and your hunting buddies can now enjoy the comforts of a basecamp AND the mobility of a tent no matter where you hunt or in what conditions you’re hunting. My hunting partners and I are probably a lot like you. We want to hit new territory whenever our schedules permit. That means do-it-yourself elk and mule deer hunts out West if the hunting gods are smiling on us that year (more precisely, if we’ve managed to squirrel-away enough money to afford gas, food, and OTC tags), or if we’re trying out remote public land opportunities for whitetails near our Appalachian homes. The problem is, sleeping on the ground in backpacking tents during sub-freezing weather for several days doesn’t hold the same appeal it once did. A camper is not an option because none of us have one, and we couldn’t get one on the Forest Service backroads even if we did. 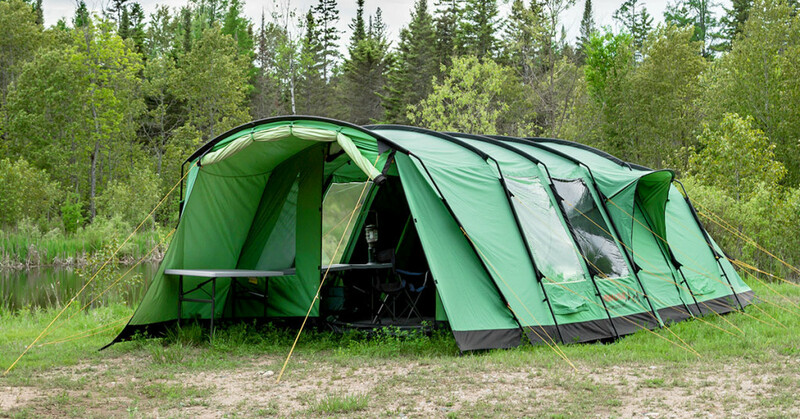 Recently, we came across the solution we’ve been looking for—a new product that combines the substantive feel and comfort of an outfitter-type basecamp with the mobility of a multi-person tent. When we say substantive, we mean that, in addition to superior construction and materials, this shelter is also insulated. That’s an industry exclusive for a soft-wall shelter. And best of all, by spreading the cost across our hunting group members, the individual investment is marginal and a real bargain considering our ability to set up a “solid” deer camp practically anywhere. This solution is called the Crua Loj (Algonquin for lodge), and it is the brainchild of the folks at Crua Outdoors—an Irish/American company with distribution and sales headquarters in upstate New York and engineering and global operations based in Ireland. “Crua” is a Gaelic word for tough/hard/durable, and once you see first-hand what Crua tents are about, you’ll understand that “crua” is a term well-suited. The Loj is the standard bearer of the Crua tent lineup, and it is ideal for group hunters looking for maximum cold weather protection, comfort, and mobility in an on-the-go deer camp. The big news, as mentioned earlier, is that the Crua Loj is not a single-wall tent, but a robust base tent design (more on that in a moment) that combines with a multi-layer “inner tent” that assembles inside the sleeping quarters. An insulated tent? You bet! 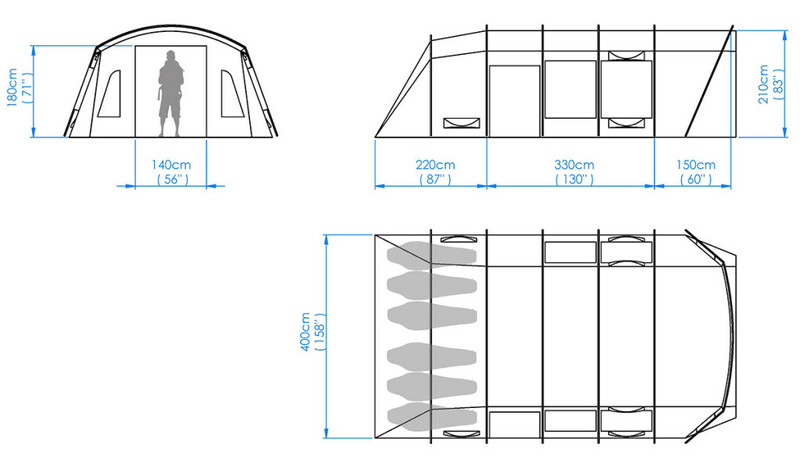 Crua tents feature a multi-layered insulated “inner tent” that sets up inside the sleeping quarters of the base tent. This insulated “sleeping pod” keeps you warm in the cold weather and cool in the warm weather, as well as blocks light and dampens outside noise for improved sleeping conditions. As you can see, the insulated front wall/doorway separates the sleeping area from the living area. You can even divide the sleeping area by installing the supplied divider wall. In all, the Crua Loj sleeps up to six adults. First, it keeps you warm in cold weather and cool in hot weather. In fact, the Loj has about 13 times the heat retention capability of standard single-wall tents. If you have camped in sub-freezing weather, you know that this can make a HUGE difference in comfort. Because of the insulated inner tent’s ability to provide a comfortable sleeping environment across the temperature spectrum, the Crua Loj is suitable for those warm, early season hunts all the way through the cold late-season. Second, thanks to the inner tent’s multi-layer design, the sleeping quarters exhibit significant sound-dampening qualities. That goes a long way towards getting a good night’s sleep. Third, the thick wall construction, which utilizes inner and outer layers of black polycotton, effectively blocks outside light. Again, that makes for some great sleeping—especially if you want to catch a nap between your morning and evening hunt. The Loj’s sleeping quarter can hold up to six people. The cool thing is that this area can be divided in half with the supplied curtain (which also boasts an insulated, multi-layer construction). Heavy duty materials and intelligent design are hallmarks of the Crua insulated tents. For group hunting, the Crua Loj can’t be beat as a mobile shelter that’s also spacious and comfortable. The three rooms (outer vestibule with awning, living room, and sleeping room) offer space efficiency and improved organization when multiple hunters are sharing the same camp. The Loj is divided into three rooms. There is an outer vestibule (no floor) that works as a storage and cooking area, an inner living room for lounging, dining, or dressing for your hunt, and the back sleeping room (which can be further divided into two rooms). The vestibule door can be raised and used as an awning to extend the sheltered area an additional six feet. Another unique feature found in the Loj is the insulated carpeting in the living room and the sleeping areas. This carpet not only helps make the rooms quieter and more comfortable to walk and sleep on after a day in the bush, it also adds to the rooms’ warmth by as much as twenty percent. Finally, some of the design features of the Loj pay special attention to the ergonomic needs of group camping. For example, there are two doors, in addition to the front door, that are located on each side of the Loj to provide access to the living area. Those are welcome portals when you have several guys trying to get dressed and into the woods before daylight. All doors have zippered bug screens, which are a benefit during warm weather, and large ventilation panels located throughout the living and sleeping rooms help minimize condensation and provide some fresh air circulation. Finally, there are access slots along the lower wall to run power cables from your generator to the living room. That’s perfect if you need to string some lights or recharge batteries at the end of the day. As you a can see, the Crua Loj is a serious shelter and a real investment. Since it is designed as a more mobile and warmer alternative to traditional cabin tents, the Loj is a logical group purchase if you like to hunt in groups of three or more. The Crua Tri is the diminutive version of the Crua Loj. The Tri sleeps three, but offers the same warmth and protection as the Loj. If you are a solo hunter, or typically truck camp with one or two friends, you can still have the warm and comfortable benefits of the Loj, but in a smaller, even more portable alternative. 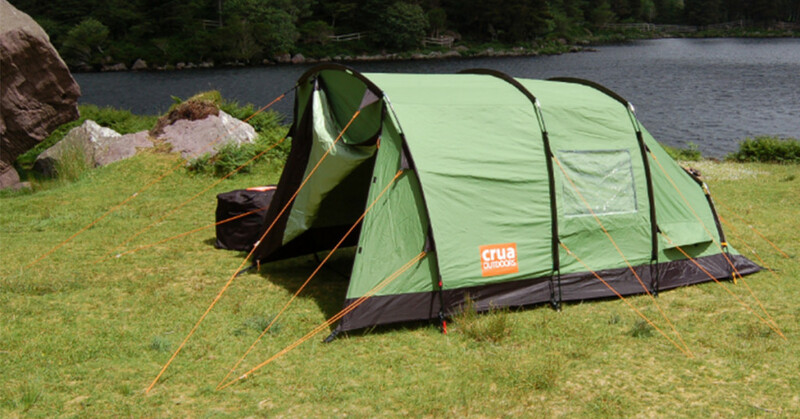 It’s called the Crua Tri, and it is made with the same Dura-Breathe polycotton outer shell and insulated inner tent combination. The key difference is the size. At 126 inches long, 79 inches wide and 62 inches tall, the Crua Tri easily sleeps three adults. For those of you who may want to pitch camp, hunt, then travel to another area and pitch camp again, the Crua Tri is perfectly suited for the nomadic hunting lifestyle. This tent can also keep you comfortable in some pretty serious weather conditions. Watch this video to see how the Tri stands up to high winds, and keeps things comfortably quiet inside even when it’s howling outside. Camping doesn’t have to mean roughing it. After a grueling day stalking or working a stand, you want a quiet, warm, and cozy place to rest. And if you hunt with a group of friends, add “elbow room” to that must-have list. The Crua Loj or the Crua Tri will fill the bill. Check out the Crua Outdoors website for more information on this revolutionary tent technology, and how these tents can change your hunting game forever. For an in-depth video walk-through of all the features and benefits of the Crua Outdoors insulated tents, visit the Crua Outdoors YouTube channel.